An "RC" in GTA III. In all of its appearances, the RC Bandit is primarily used as either a controllable bomb or as a racing toy. The race car-like design of the vehicle has virtually remained unchanged between Grand Theft Auto III and Grand Theft Auto: San Andreas, but the Grand Theft Auto: Liberty City Stories rendition of the RC Bandit is redesigned as a miniature pickup truck-based monster truck. The GTA III rendition originally features only one color scheme, while the other renditions support a wider range of colors, including blue, red, yellow and green. The GTA San Andreas rendition also lacks a swaying radio antenna, unlike the other renditions. Performance of the vehicle is as expected; being small and light, the RC Bandit is highly nimble with excellent acceleration, but has a low top speed. Because the RC Bandit in GTA III to GTA San Andreas features very stiff suspensions, the cars are susceptible to rollovers on bumpy terrain. The GTA Liberty City Stories rendition, however, receives performance tweaks, including a slightly improved top speed and soft suspensions that allow it to traverse uneven terrain much better. In Grand Theft Auto III, entering a Toyz van will trigger a side mission, in which the player must destroy as many gang vehicles as possible using RC Cars rigged with explosives. It is also used in Toyminator to blow up three armored Securicars. In Grand Theft Auto: Vice City, entering the Top Fun van parked in Washington Beach will trigger a side mission, in which the player must race around a course using an RC Bandit. In Grand Theft Auto: San Andreas, the final mission for Zero involves helping him move an RC Bandit across a model battlefield as Berkley tries to trap and destroy it. 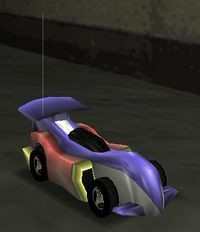 The car is controlled only by Zero, with the player controlling an RC Goblin as support. It is an inaccessible vehicle and cannot be obtained by the player. In Grand Theft Auto: Liberty City Stories, there are three checkpoint races which involve the player compete using a RC Bandit against three others as well as RC Bandits used as bombs is RC Triad Take-Down. "RC Bandit" is a play on arse bandit, another sexual joke by Rockstar. If the player tries to enter the vehicle in any games without further modifying the game, the player will "open" a door and the game will crash. RC Car, GTA 1 equivalent. This page was last modified on 20 July 2012, at 20:36.